Ouzo and citrus. A marriage of flavour. Looking for something a little different to make? Try my orange, ouzo and pistachio cake recipe. The ouzo gives it flavour and the icing is out of this world! I remember visiting an aunt’s place over Easter when I was a younger lad . Now that in itself is nothing spectacular. Greeks and Easter means a myriad of visits to friends and family, copious amounts of food and big celebrations. What I remember about this visit was the distinct taste of her koulouria. Of course I couldn’t help myself and in an abrupt manner, blurted that her koulouria tasted “better”! The look on my mother’s face is another story but I always remember her response. “I always add a little ouzo to my sweets”. This little flashback was the catalyst for my next two recipes featuring Australia’s number one ouzo, Barbaresso Ouzo. My previous recipe can be found here. I played with a few ideas and finally went with this orange, ouzo and pistachio cake recipe. Flavoured with orange and pistachios the Barbaresso ouzo lends a complementary aroma and flavour. It does not overpower at all. I know a lot of people get scared with the whole aniseed thing. I’m confident in telling you that the ouzo works wonders in this recipe. When I finished baking the cake, I thought it looked a little bare. Of course I couldn’t help myself and finished it off with a gorgeous, thick, pourable icing. With a little extra orange, the icing added a welcome element to the cake. And don’t forget those roughly chopped pistachios on top. They provide a wonderful texture and crunch! Scroll down for my orange, ouzo and pistachio cake recipe. 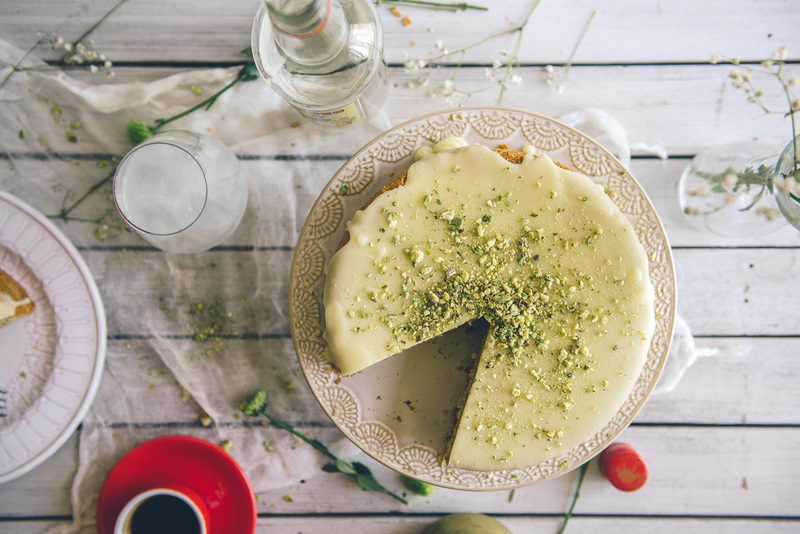 An aromatic cake flavoured with orange, ouzo and pistachio. It's different but it will make your kitchen smell incredible. Preheat your oven to 180 deg C and grease and line a 20cm cake tin. Set aside. In a stand mixer beat the eggs and sugar until pale, creamy and thick. Add the olive oil, ouzo and orange zest and whisk to combine for a few more seconds. Remove the bowl and fold through the plain flour, pistachio meal and baking powder. Once it’s all mixed, pour into pre-greased cake tin and cook for 40-45 mins or until a skewer inserted in the centre comes out clean. Allow the cake to cool completely before topping with icing. To make the icing, combine all the ingredients except the icing sugar over a low-medium heat. Stir through the icing sugar and whisk for 5 mins. until thick. Pour over cake and allow to set for 10-15 mins before topping with roughly chopped pistachios and slicing. Serve with Greek coffee and ouzo. To make pistachio meal place 60g of whole pistachios in a food processor and whizz until the mixture resembles coarse breadcrumbs.